Walker’s crisps are always a favourite in our house; we like nearly all the flavours but we do tend to argue over who gets the cheese and onion ones! 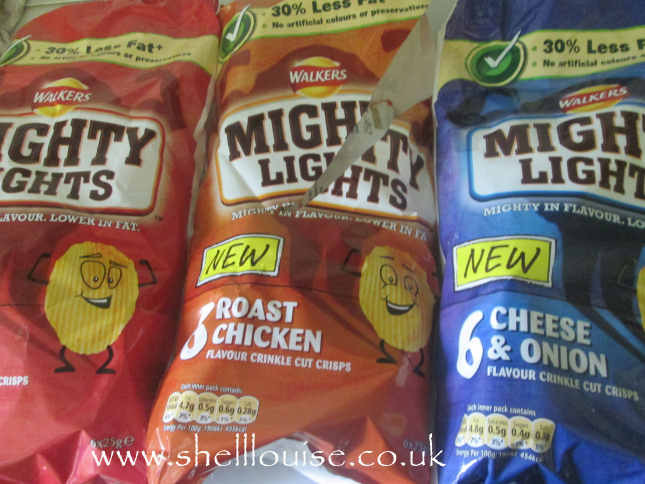 The day Walker’s sent us some new Mighty Lights to try, the girls and I were just off out for a picnic in the park with some friends so we grabbed one of the multi packs and took them with us. 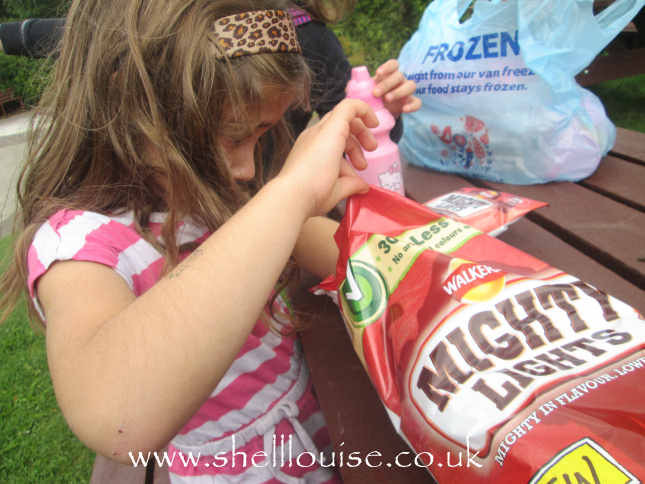 At 30% less fat than regular crisps they were a good option for the girls and because of the reduced fat I was able to have a packet, using only 5.5 syns from my daily Slimming World syn allowance. I love crisps and wouldn’t be able to cut them out of my diet so being able to have a proper packet of crisps that are delightfully crunchy while not using too many of my precious syns makes me very happy! Mighty Lights have been a big hit with everyone here, so much so that I didn’t manage to get to them quickly enough to take the photo before they’d opened all three packets! The crisps come in Cheese & Onion, Roast Chicken and Lightly Salted. I’m not usually a fan of salted crisps, always thinking them to be the ‘boring’ option out of the multi-packs when I was younger but these Lightly Salted ones are really lovely. Both Ant and I said that they were nicer than regular salted crisps; in fact, we believe the same to be true of all three flavours. I don’t know if it’s the flavour of the ridged crisps mingling with the added flavours but there’s something in them that makes them tastier than regular crisps while at the same, seeming lighter in flavour. I hate when you can still taste the cheese and onion flavour in your mouth hours later when you’re trying to enjoy your next meal but these crisps didn’t leave that after-taste which is a big plus in my book! I’d be quite happy giving them a packet of these crisps in their lunchbox occasionally, not only because of the lower fat content but because they’re made from real potatoes, they don’t contain any artificial colours or preservatives and they’re a source of fibre. The kids love them as much as Ant and I but this time, instead of fighting over the cheese & onion ones, they’ve been fighting over the roast chicken flavour! I can safely say that Walker’s Mighty Lights get a big thumb up from all of us and the children will find them in their school lunchboxes from time to time, that is if Ant and I don’t get to them first!